revealing our faith and interest. praying for the grace to enter. we are blissfully bathed in divine light. discovered by the embrace of the holy name. Submitted by Roma Gopi on Fri, 2012-06-22 09:20. Please accept my most humble obeisances. 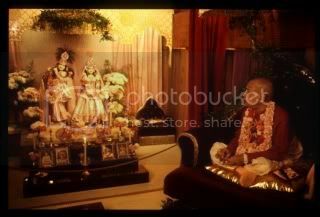 All glories to Srila Prabhupada and all glories to you! Happy Appearance Day! I feel so blessed to have had your association through your wonderful blogs and I hope I can always be blessed through such an amazing association of yours. I would like to take this opportunity to sincerely thank you for being such an inspiration through the amazing power of words. Submitted by Karnamrita on Fri, 2012-06-22 18:22. Thanks Romaji, for your kindness and generosity. I bow down to your appreciation, and honor your gifts. Whoever I may be or not be, I can say that I pray often to serve the devotees through my words and life. 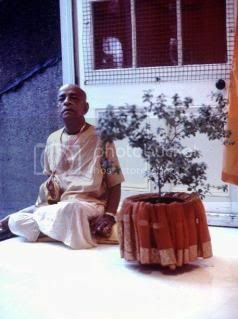 I am only a very tiny devotee, but since I pray a lot, Prabhupada, my gurus, and Shri Gaura Nitai, have been very merciful to me. I can't think of what other reason I have been so blessed. Otherwise I would not still be alive or able to communicate. I'm not the most anything, but I am insignificant. 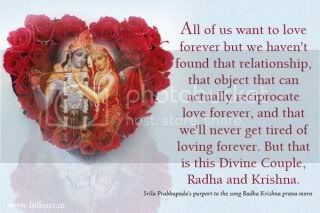 In spite of myself, Krishna is kind. Of course, it is easy to be self-effacing and speak humble words, yet as an aspiring devotee, I aspire to practice the 3rd verse of Shri Chaitanya, or Shikshashtakam. Very "high" to feel lower than the grass, with tolerance like a tree, offering all respects to others, while not wanting praise oneself. Nevertheless, by the mercy of Shri Guru and Gauranga, all things are possible. Such humility is the nature of the soul, imbued with prema, so I have a long way to go. Still, I do my best to remember that whatever talents or success I have is purely Krishna's mercy. Let us all encourage one another to do deeper into our spiritual practices and to the best of our ability to share our good fortune, and whatever we have understood.